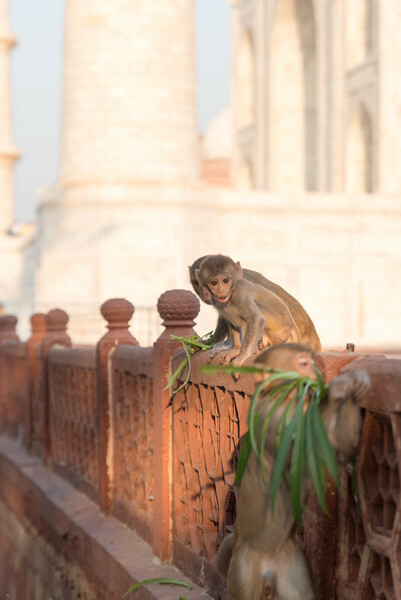 From Varanasi we traveled by plane to Delhi, and then by van to Agra, home of India’s most famous monument, the Taj Mahal. 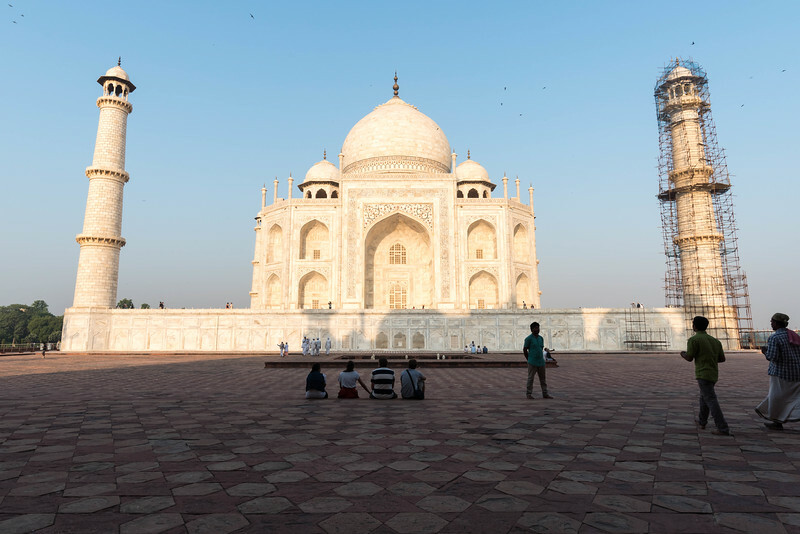 We were greeted with our first glimpses of the Taj from our hotel after checking in. 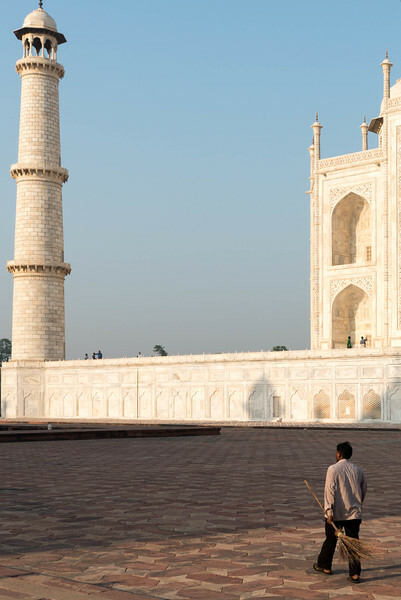 Early the next morning, our guide met us at dawn to take us to the Taj Mahal, where we watched the sun rise over the monument’s white marble. 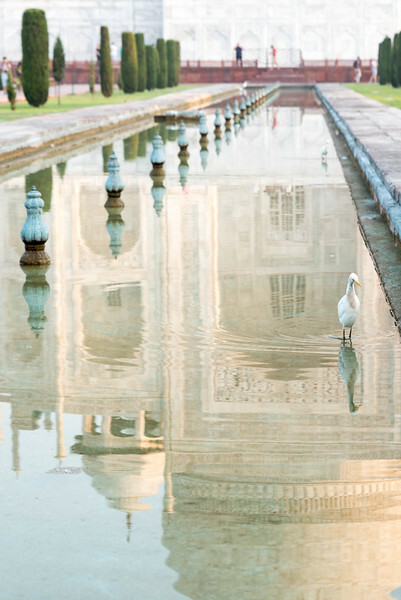 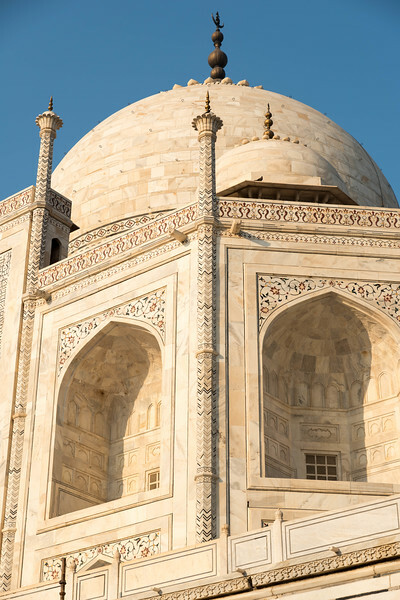 The Taj Mahal is worthy of every bit of hype it enjoys – it truly is one of the world's most stunning structures. 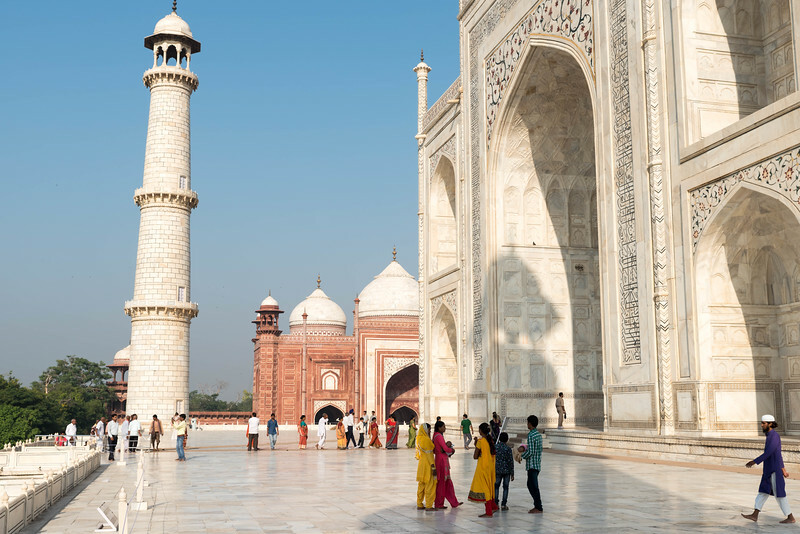 But, as impressive as the Taj Mahal is, it is far from Agra’s only attraction. 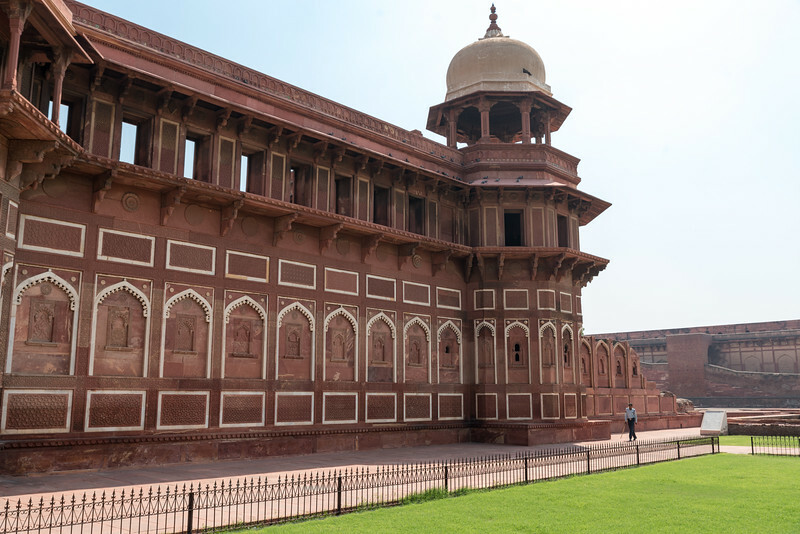 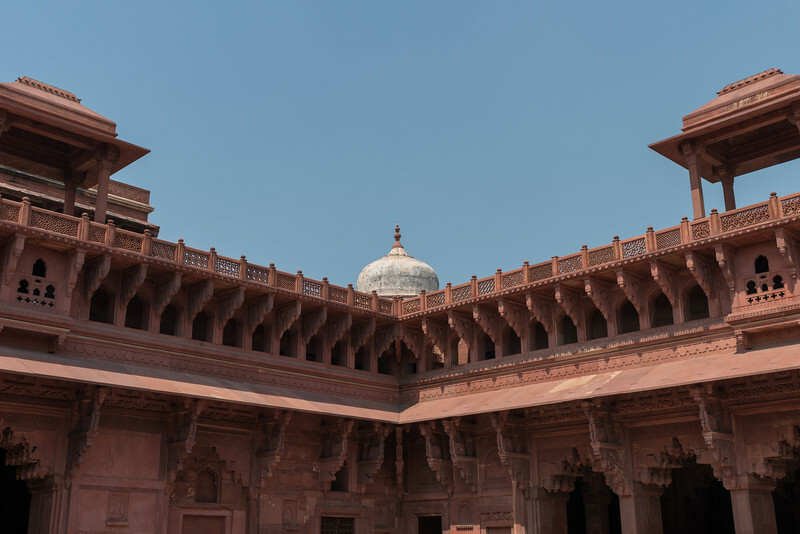 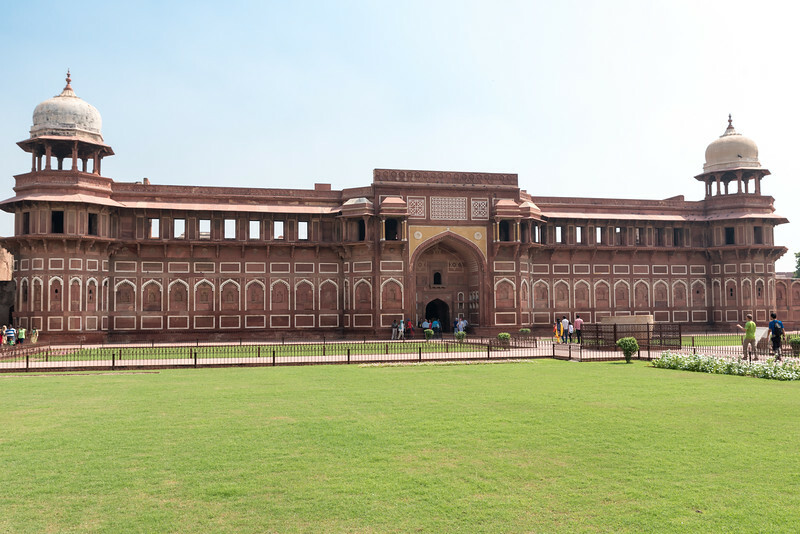 After a return to the hotel, some time to freshen up and eat breakfast, we ventured back out to explore the Agra Fort, which like the Taj is also a UNESCO World Heritage Site. 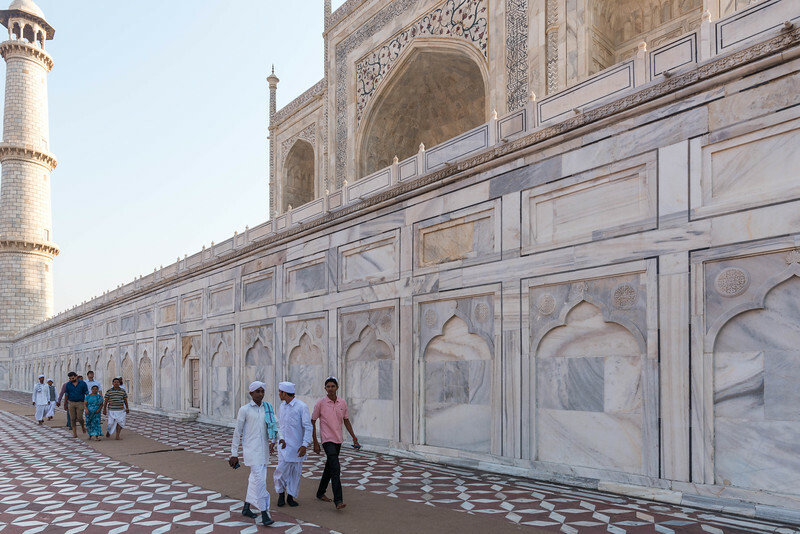 And, later that day, we took our third tour in Agra, a walking and cycle rickshaw tour led by our excellent guide from Agra Walks. 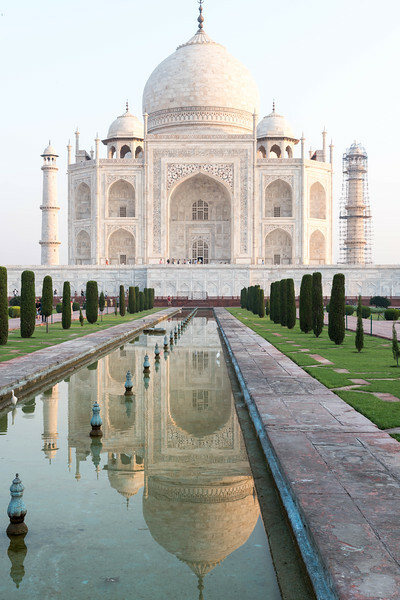 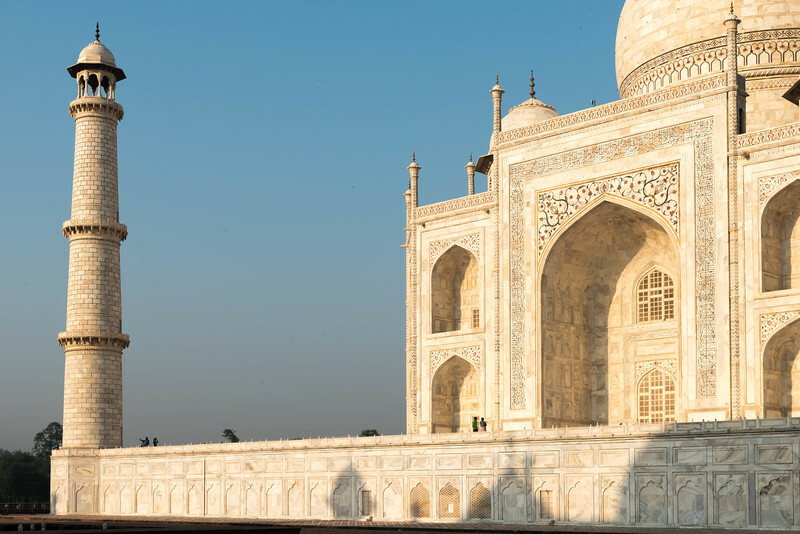 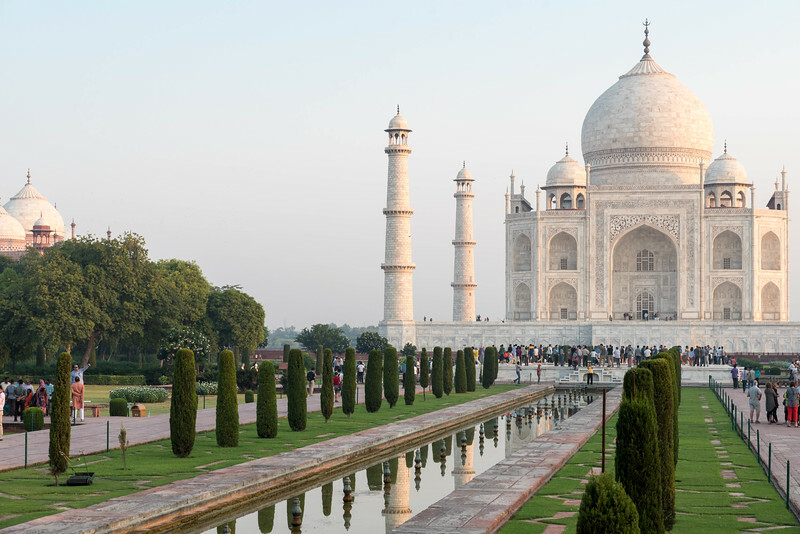 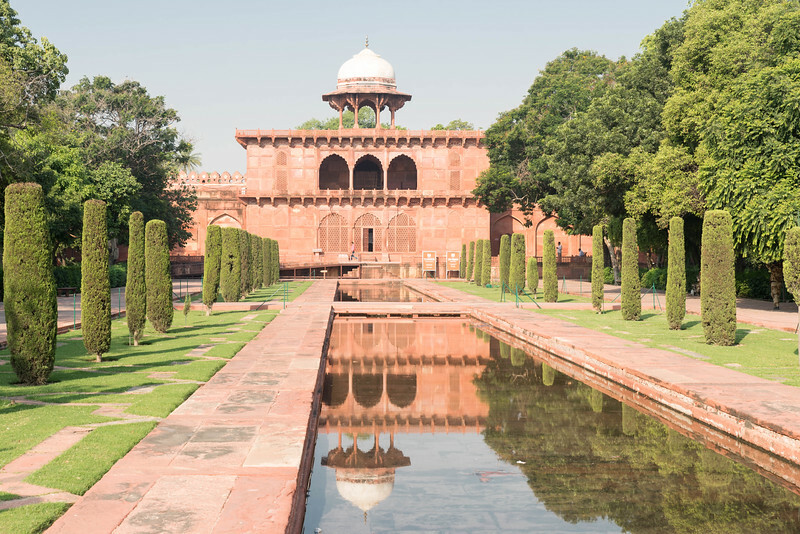 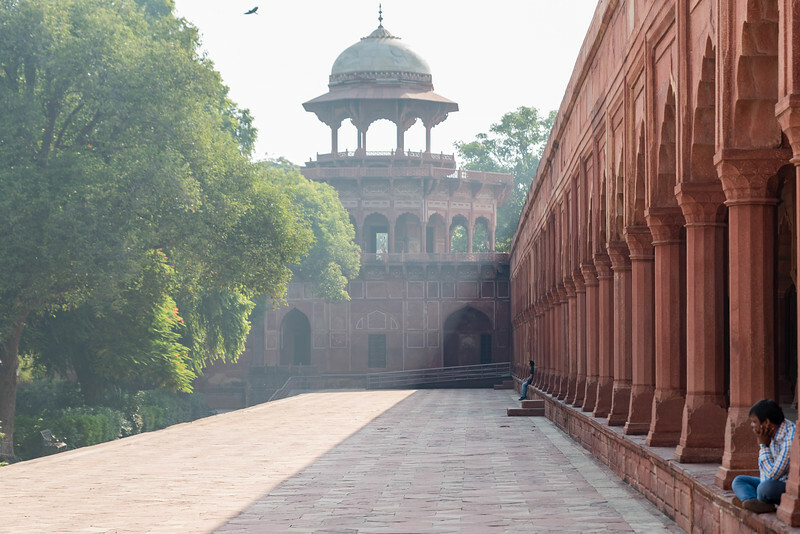 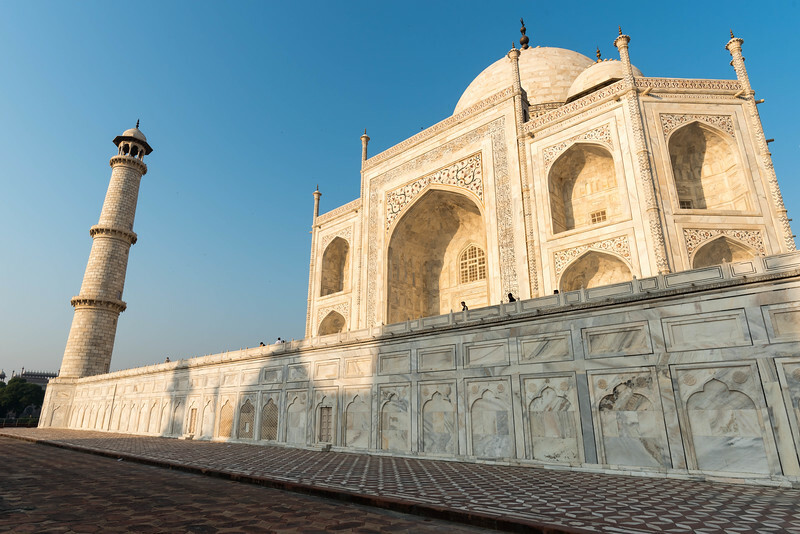 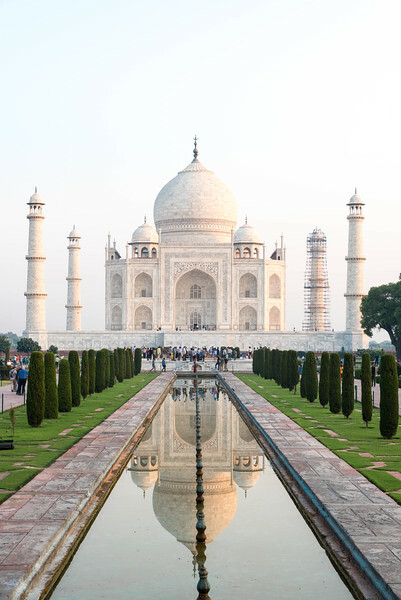 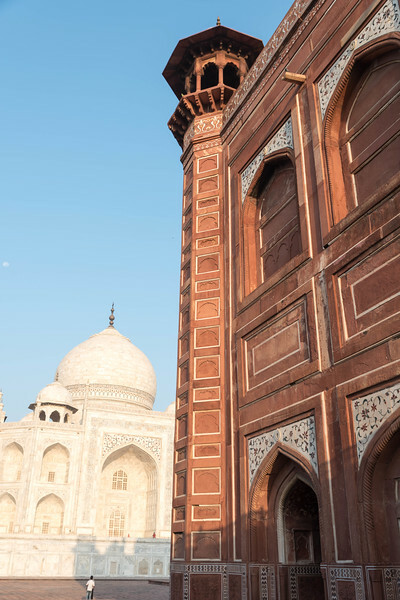 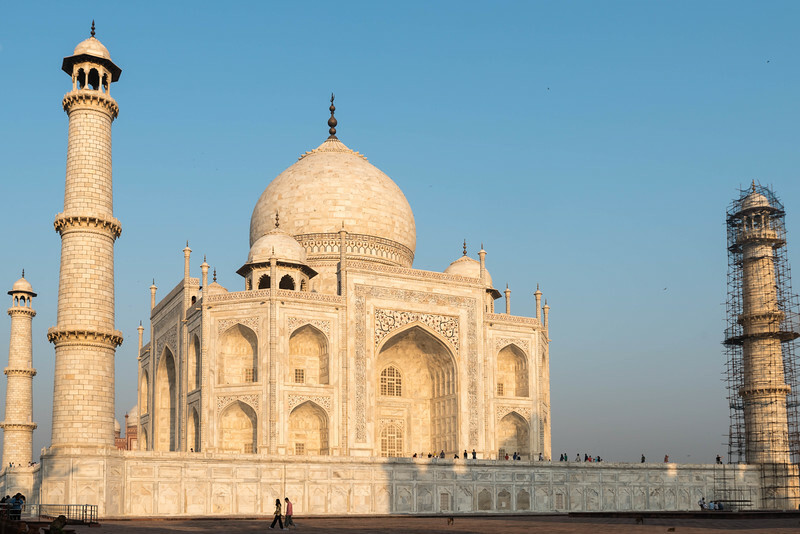 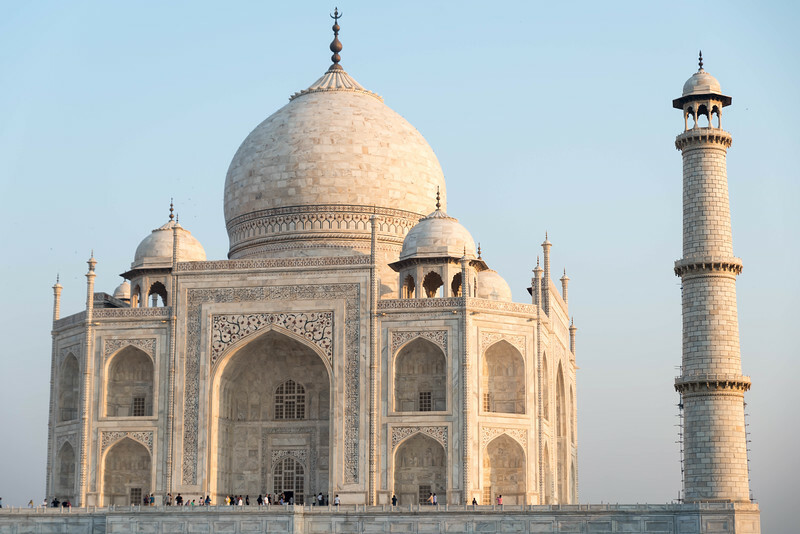 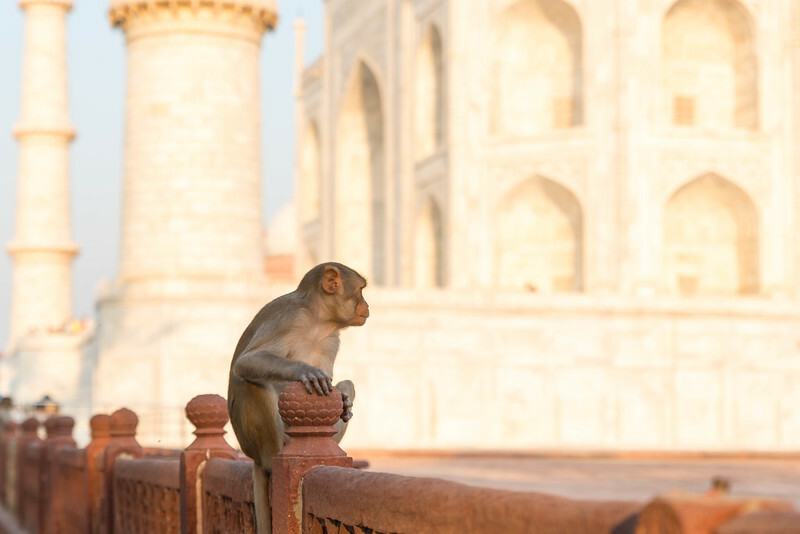 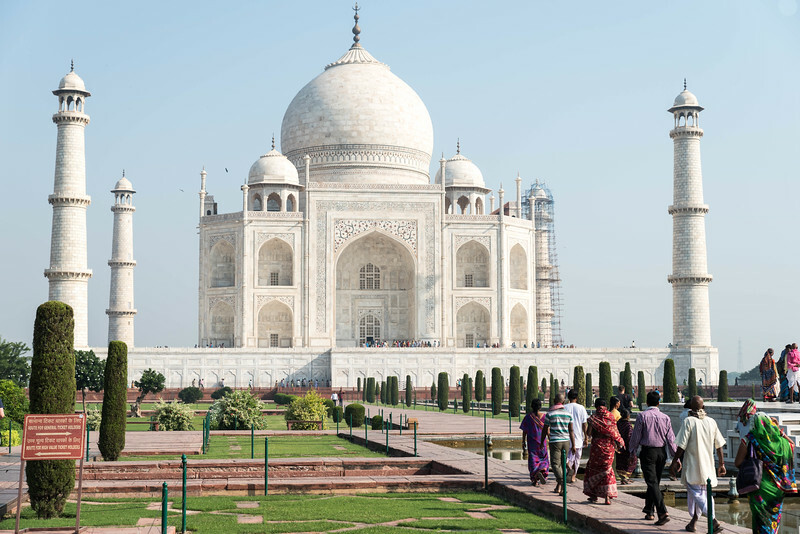 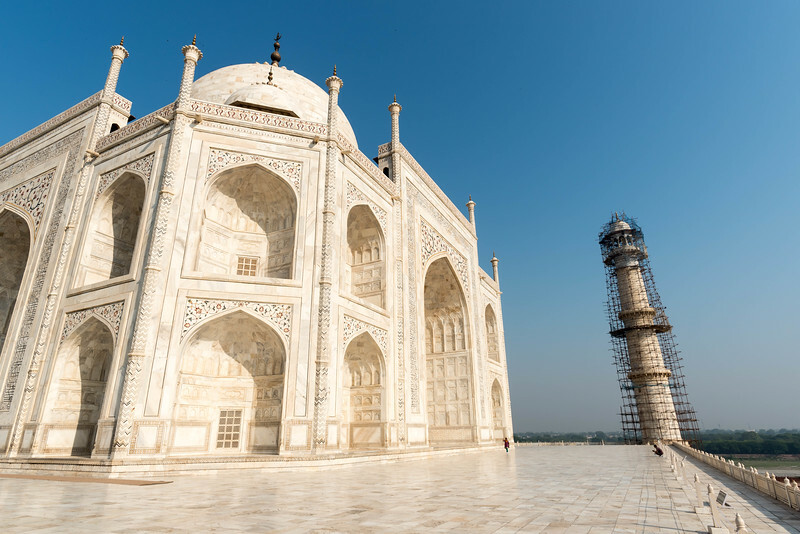 This tour took us into the city's historic commercial core, to one of India's largest mosques, a Hindu temple, and marketplace, before ending the day with a sunset view of the Taj Mahal. 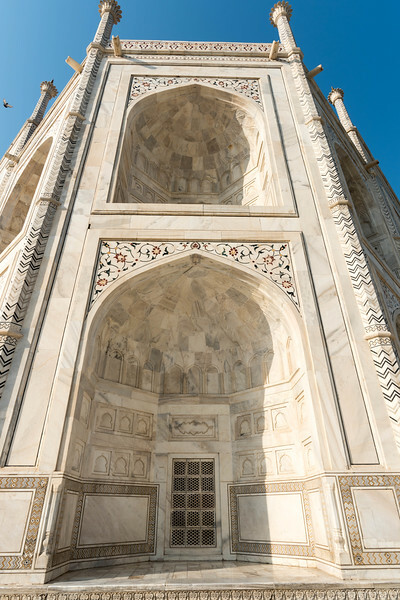 The gateway to the Taj Mahal. 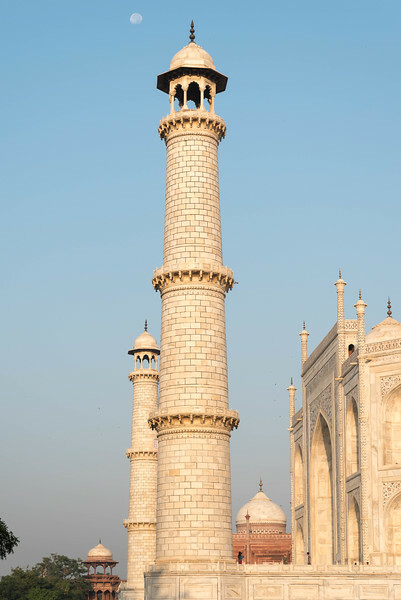 The front minarets on the Taj Mahal, with the mosque in the background. 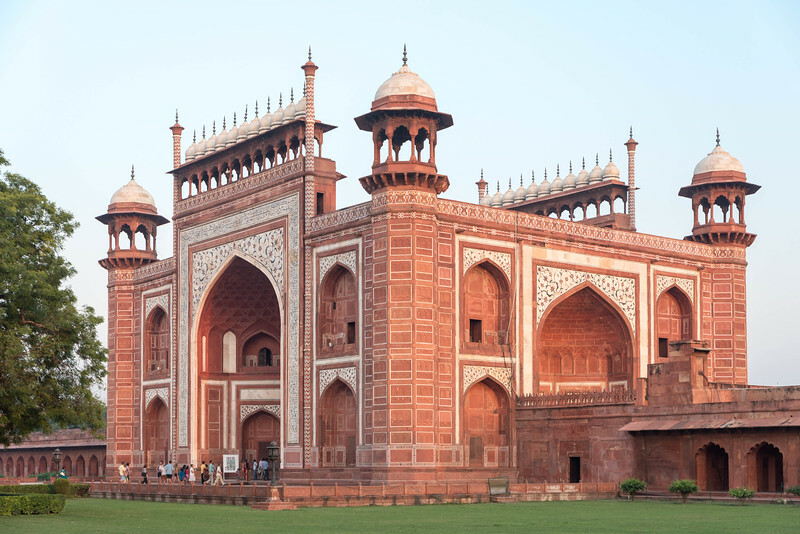 The Jawab is one of two identically designed buildings that flank the Taj Mahal, providing a symetrical framing of the mausoleum. 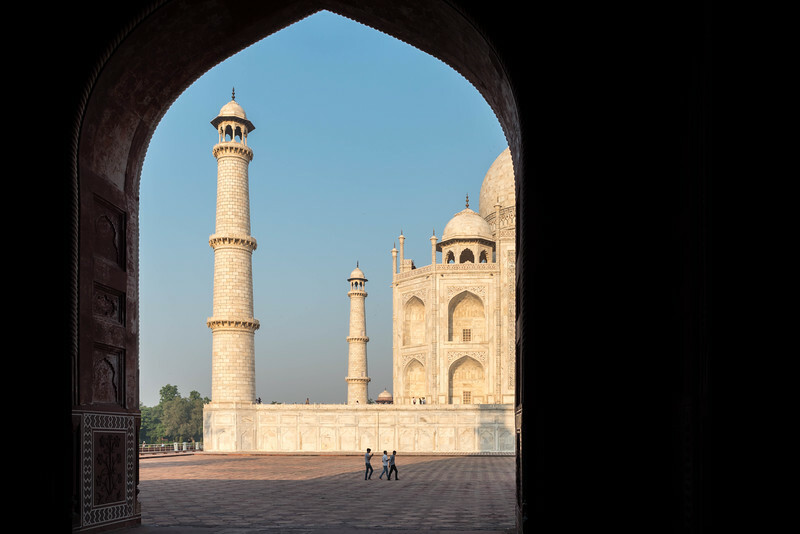 View of the Taj Mahal from one of the arched doorways in the Jawab. 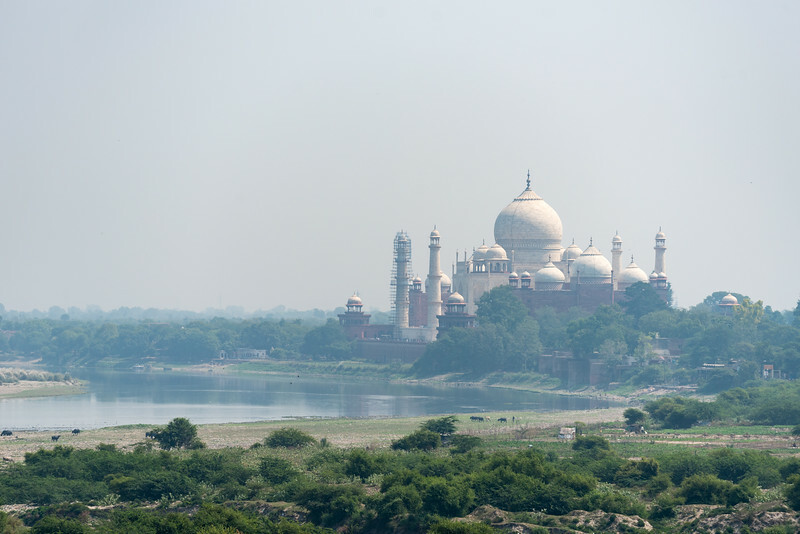 The Taj Mahal, viewed from the east, in front of the Jawab. 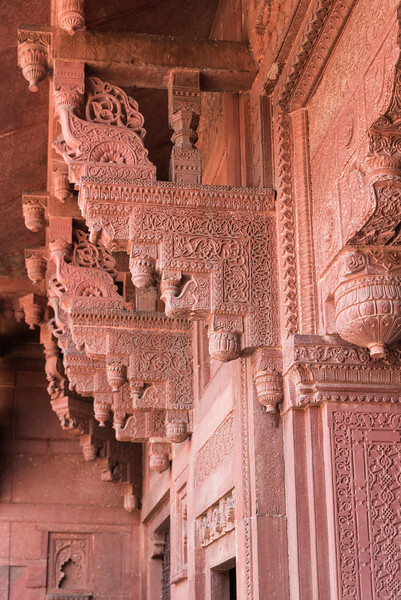 Detail of the stonework on the exterior of the Jawab. 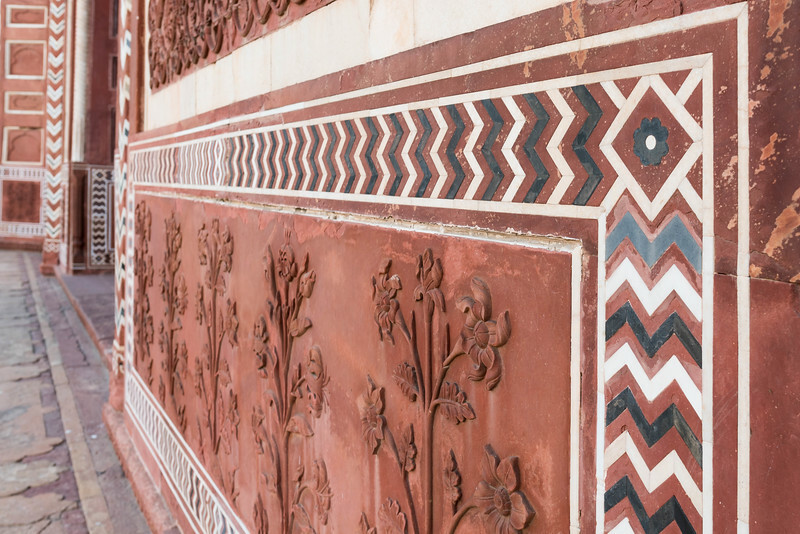 Each of the different colors is made by carving out space to lay in different types of stone. 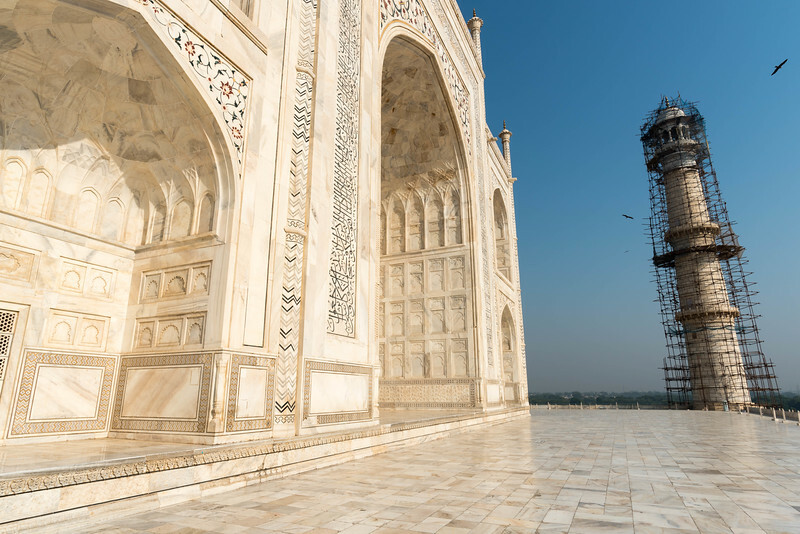 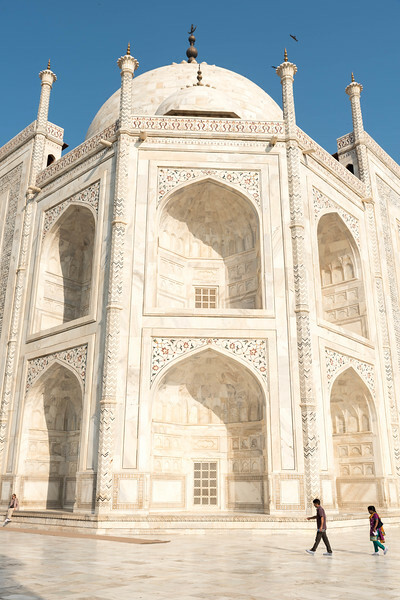 Nothing is painted on any of the structures at the Taj Mahal. 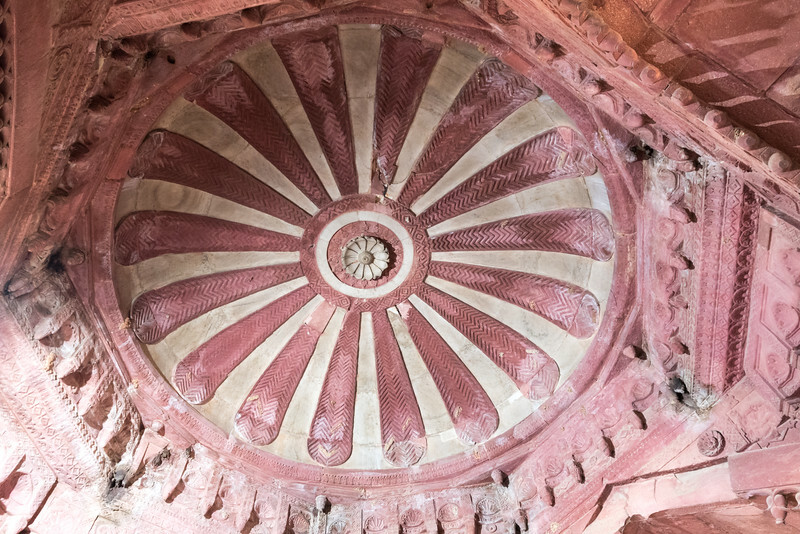 One of the domes and arched doorways in the Jawab. 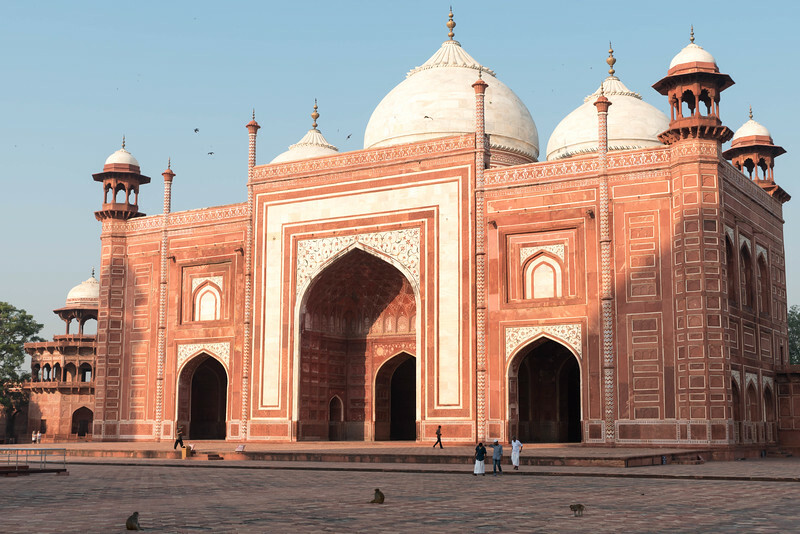 The mosque at teh Taj Mahal. 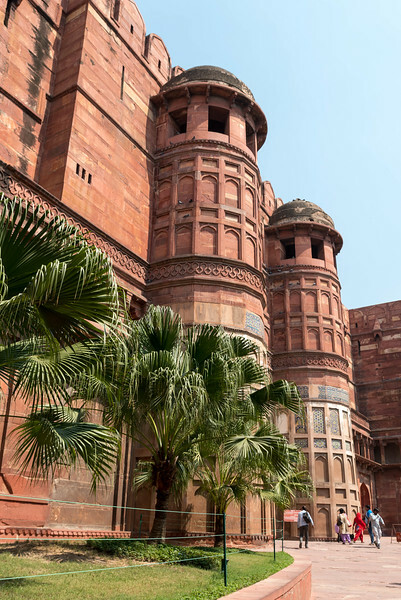 It is identical in design to the Jawab. 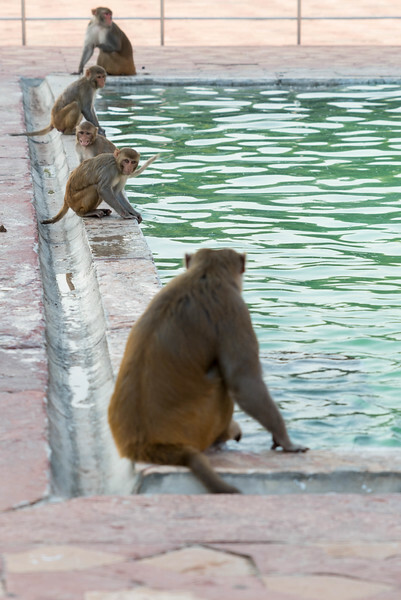 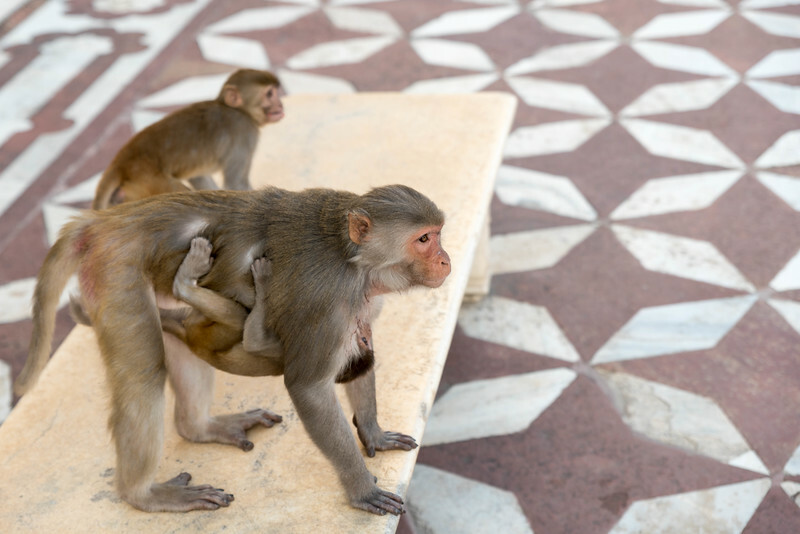 Monkeys playing in a fountain between the mausoleum and mosque. 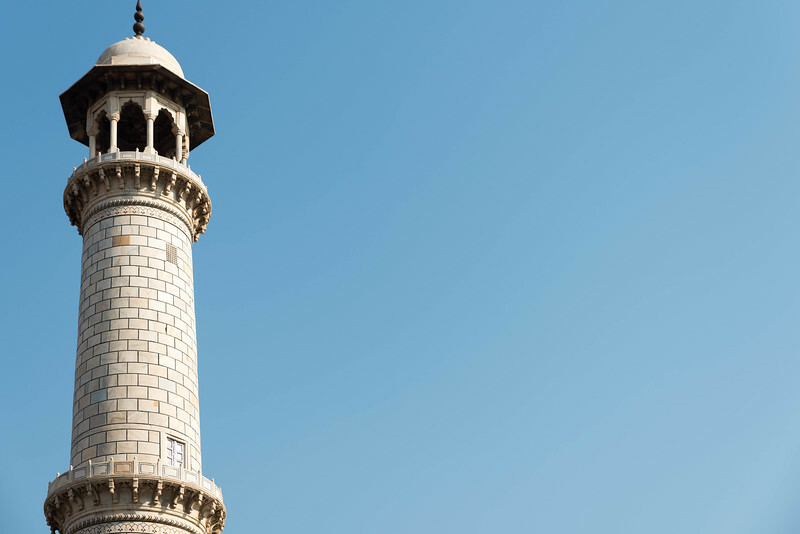 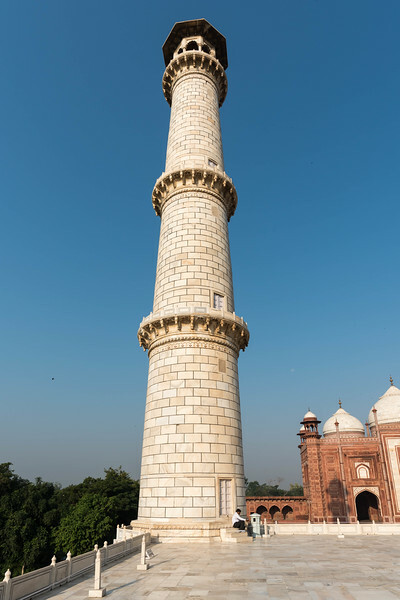 The minarets were designed to lean slightly away from the mausoleum, to protect the main structure from a minaret collapsing in an earthquake. 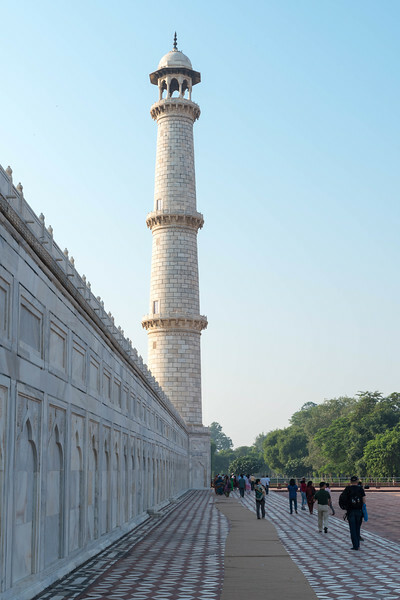 The lean is quite evident when standing near the mausoleum. 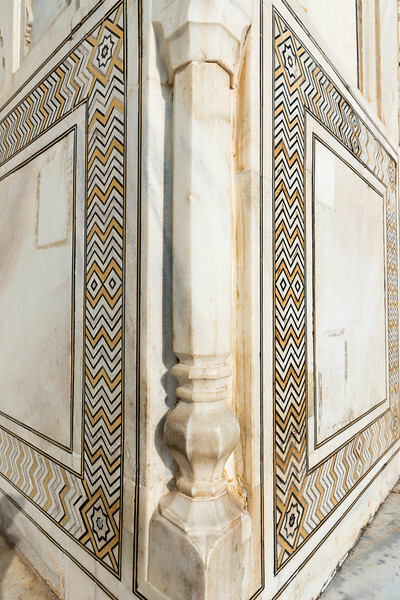 Details of the stonework on the mausoleum. 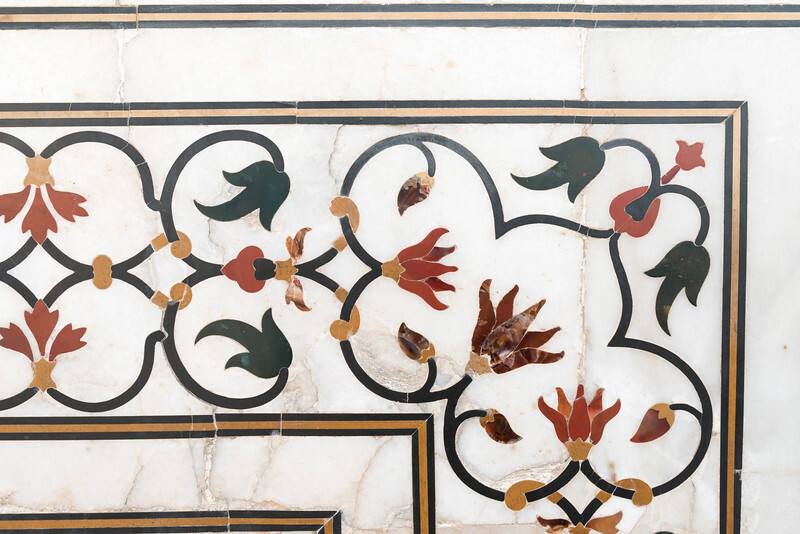 All of the designs are formed by carving and inlaying stone - nothing is painted on. 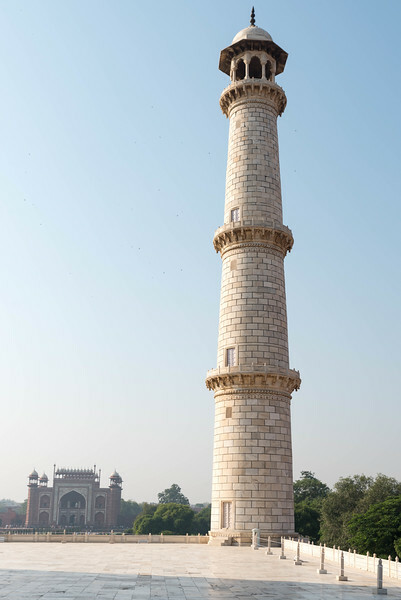 A minaret with the gateway in the background. 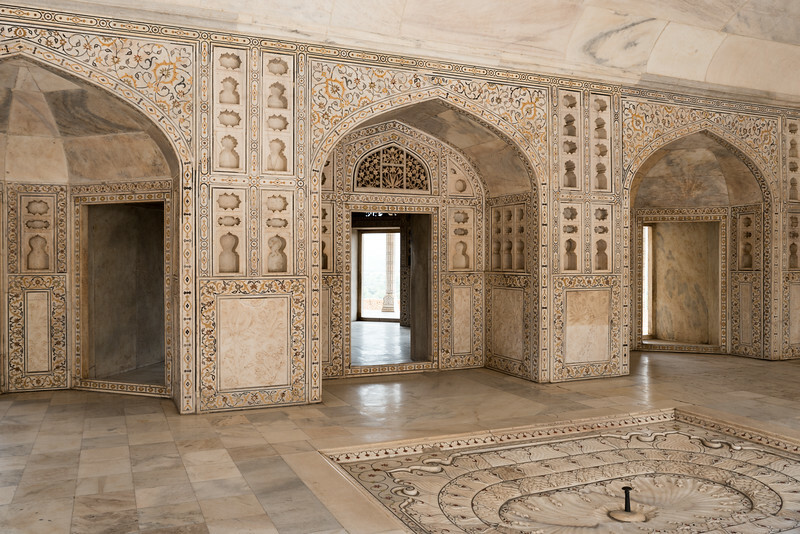 The museum in the Taj Mahal complex. 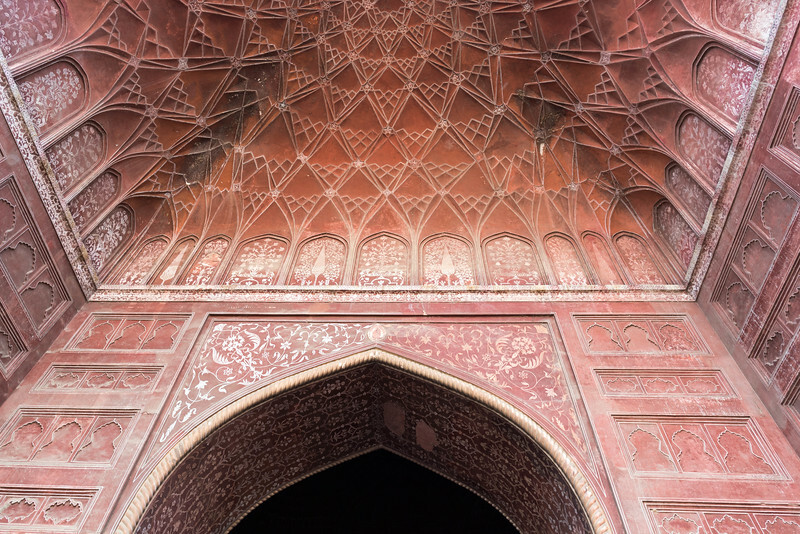 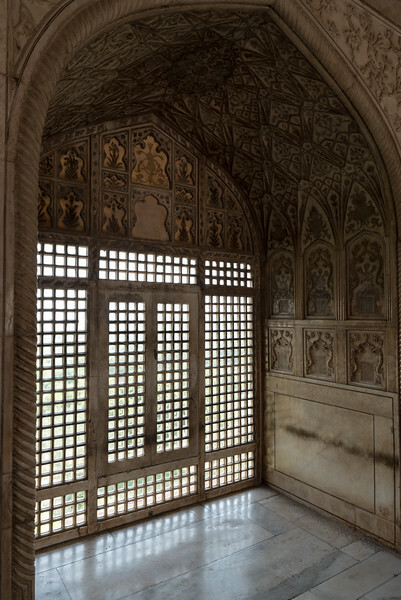 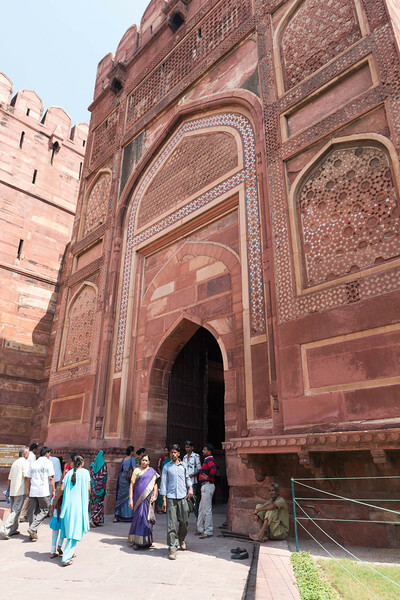 The entrance for tourists visiting the Agra Fort.